With Its chrome plated brass body the Giotto Metal Ball Pen is perfect for conveying an image of traditional values to your target audience. Its appearance belies the relatively low cost of ownership and consequently it’s one of the most time-honoured promotional pens in our entire range. It is fully compliant with current safety regulations; comes with a high capacity black refill containing documental ink and an optional express printing service for those tight deadlines. 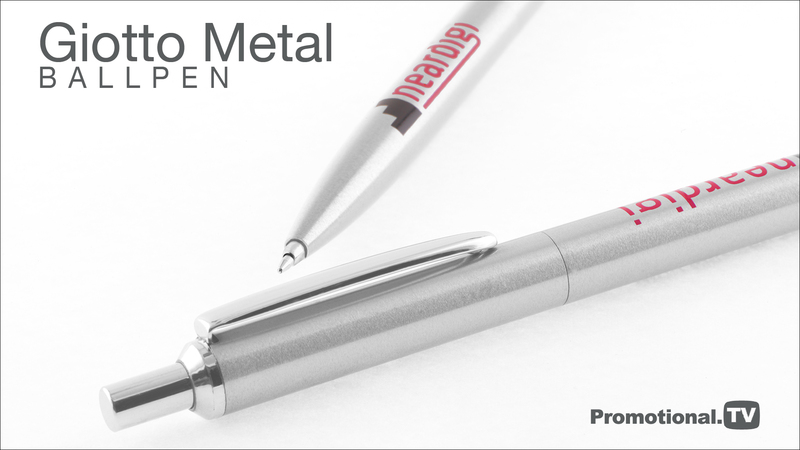 The Giotto Metal Ball pen, as with the Giotto Metal Pencil version operates on a push-button mechanism and the barrel is suitable for printing your advertising message in up to 6 matched colours. If you require a more classical style of marking we can also laser engrave the barrel or upper part to your requirements. It can be supplied individually with a range of optional presentation packaging or why not consider the Giotto Metal gift-set comprising Ball pen and matching Mechanical Pencil for those prestigious promotions. Order the Giotto Metal Ball Pen today and you will receive a Free Gift; just check out the free gifts tab on this page.